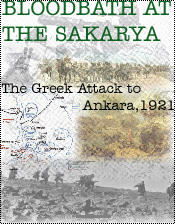 BLOODBATH simulates the horrific, turning point, battle in the Greek attack towards Ankara in August, 1921. The Greek Army had been unstoppable up to now and the Turks were reeling back to the last stand defenses in the hills just across the Sakarya River. Their morale had taken a serious blow, so serious, that orders were to shoot any Turk soldier caught fleeing during the battle. The Greeks paused for two weeks before advancing across the river, giving the Turks time to build a two lines of defenses. Greek divisions averaged 10,000 men, while Turk divisions averaged 5000. Both sides were feeling the pinch of supply issues, both quite determined to crush the other. If the Greeks won, Ankara, Turkey's new capitol, would fall and perhaps part of Turkey would become part of Greece. The battle and war all reached this pivotable situation, critcal to both sides. It would be bloody--over 18,000 died on the hills from August 23 to 30. The game comes with one 11x17 inch map, 280 counters and rulebook. Game scale: 12 hr. turns, battalions. Each hex is around 400 yds. Owners of The Great Attack 1922 will easily assimulate the rules, although there are some new ones to learn. 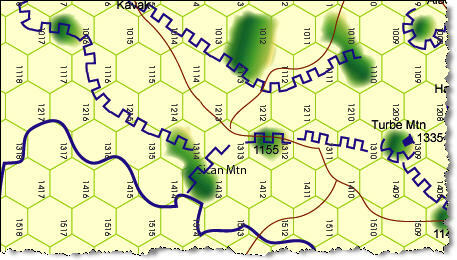 Gian Marco Franco 8 8 9 A subject very exoctic, no other choice but luckly It's a wargame well done. Graphic may be improved. Konstantinos Stefopoulos 9 7 8 A verry good adaptation of an obscure and nasty war!